When I decided to make photography my career, I promised myself I’d only photograph what I love. Not because I believed that’s where I’d find my best images (I wasn’t that calculating), but simply because the only good reason I could come up with for leaving an excellent job with a great company was to do something that made me truly happy. And lucky me—today most of my time behind a camera is spent pursuing subjects that touch a special place in my heart, subjects I’m naturally drawn to, camera or not. There’s Yosemite, for sure. And pretty much anything celestial. Dramatic weather, dogwood, poppies, oak trees, reflections all thrill me. I could go on…. And as much as I enjoy these subjects individually, I love combining more than one to create (what at least feels to me like) a natural synergy. 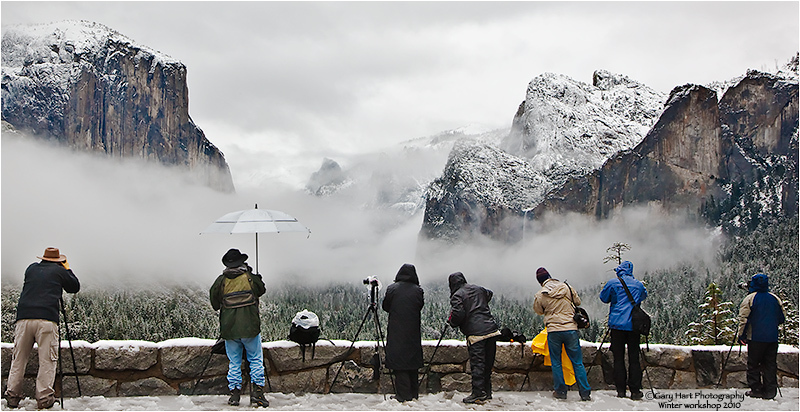 I mean, photographing Yosemite Valley is always great. And who doesn’t like to see a rainbow? 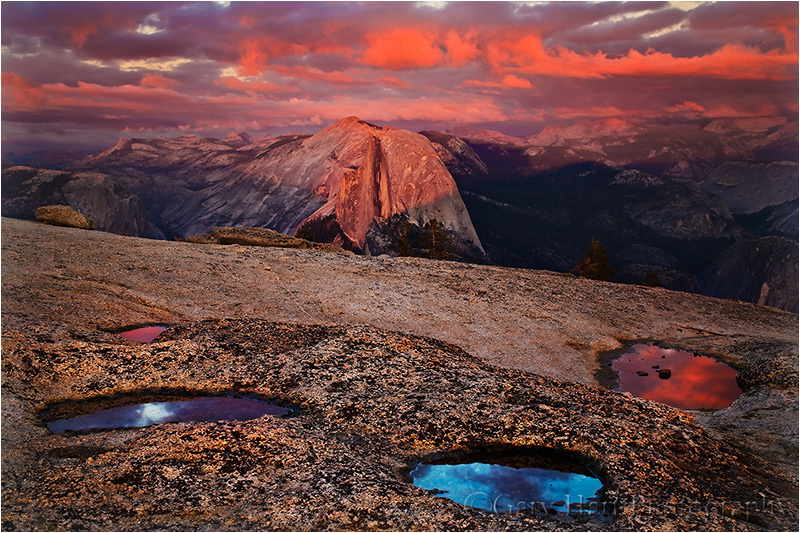 But finding a rainbow arcing above Yosemite Valley? Well, you get the point…. While Yosemite Valley is a bit of a drive, and rainbows are unpredictable, ephemeral phenomena, the oak trees I love so much are deeply rooted less than an hour from home. And the moon is nothing if not predictable. So combining these favorites simply requires mixing a small amount of effort with a little cooperation from the weather. Over the years, I’ve accumulated a number of candidate views in both directions: east for a full moon at sunset, west for a new moon at sunset; the other way around for sunrise. The east views will work for late afternoon rainbows too, but I’ve yet to capture one of those (it’ll happen). Anxious for something to photograph between my Death Valley and Yosemite winter workshops, I made a point of highlighting the evening of this January’s full moon in my calendar. And rather than return to one of my tried-and-true foothill oak views, I left early enough to explore. After a great afternoon and many discoveries, I finally landed at the end of a new, graded but unbuilt cul-de-sac with a clear view of a distant trio of hilltop oaks. While waiting for the moon to appear, I fired a few frames, silhouetting the trees against the sun descending through the orange sky, an unplanned and special juxtaposition in its own right. 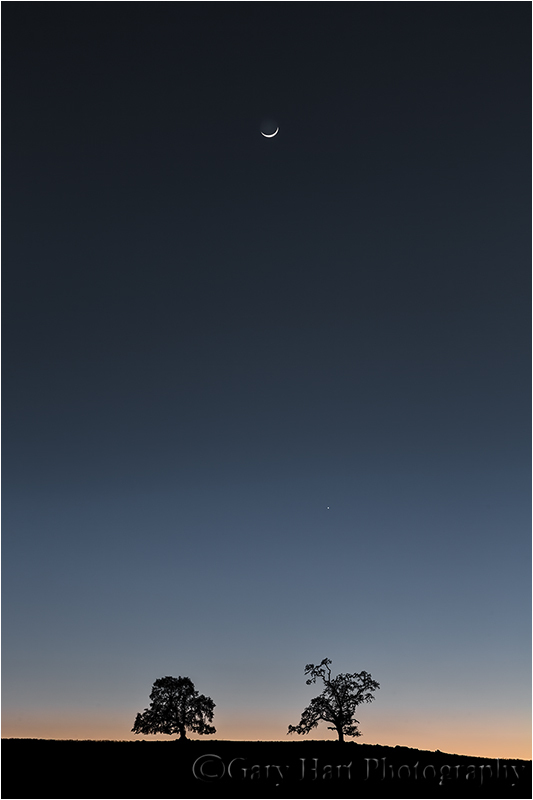 When the moon finally emerged above the darkening horizon, it was flanked by Venus. And when Mercury appeared a few minutes later (center-right, beneath the moon), I had a celestial triangle balanced above the terrestrial oaks. Synergy. I love driving the Sierra foothills east of my home in Sacramento, one eye on the road, the other scanning for gnarled oaks I can photograph against the sky. To my very California eyes, these are the scenes of home—not the palm trees and surf boards most people picture when they think of my home state. California’s oak trees’ inherent beauty stands out when they’re silhouetted against a sunset horizon. I’ve accumulated many go-to locations for just this kind of scene, but because much of the joy of photography is the seeking, one afternoon last week I left home with no agenda but to explore some of the many untried foothill roads south of Highway 50. My first detour took me into one of many new subdivisions that threaten the very foothills I love so much. Soon these wide open spaces will be smothered by homes, but right now they’re simply etched with a varicose pattern of fresh pavement. As sad as this “progress” makes me, on this afternoon the new roads gave me access to some views I’ve never had. I wound as far back into the hills as the asphalt allowed, eventually ending up at the end of a cul-de-sac with a straight-shot view of three hilltop oaks. Because the afternoon was still young, I continued exploring, but as sunset approached, I knew this view was the one that would give me what I wanted—not just a sunset, but a sunset with a two-percent crescent moon flanked by Venus. I arrived about fifteen minutes before sunset, surveyed the scene to find the best place align the moon with the trees, then watched the sun drop to the horizon. My original thought was to simply wait for the moon to appear, but when a the sun dropped into a translucent film of thin clouds gave that gave it yellow-orange cast, it occurred to me this would be a good opportunity to further test the dynamic range of my new Sony a7R. So out came my 3-stop Singh-Ray reverse graduated neutral density filter and my Sony 70-200 lens (sadly, the Canon 100-400 and Metabones adapter were at home), and I went to work. Not only was I able to get a usable silhouette that still retained the color in the sun, the 36 megapixel resolution of the a7R allowed me to crop my result to more closely match the 400mm focal length I wished I had. Life’s good. Maria von Trapp had them, you have them, I have them. They’re the favorite places, moments, and subjects that provide comfort or coax a smile no matter what life has dealt. Not only do these “favorite things” improve our mood, they’re the muse that drives our best photography. Mine include the translucent glow of a California poppy, a black sky sprinkled with stars, a breathtaking sunrise duplicated in reverse by still water, and the vivid arc of a rainbow following a cleansing rain. Also on my list (as you may have guessed by now) are the rolling hills and stately oaks of the Sierra foothills, a delicate slice of moon hovering above the horizon, and the subtle band of shifting color separating day and night. I do my best to put myself in position to photograph all of these moments—the more I can combine, the better. For example, on my calendar each month (among other things) are the best days to photograph the old moon before sunrise, and the new moon after sunset. And in my GPS is a collection of foothill locations (though by now I’m sure my car could navigate to these spots on its own) with hilltop oak trees that stand against the sky. The best evenings for the new moon in the most recent lunar cycle were Friday and Saturday, January 31 and February 1. With plans for Friday, I blocked Saturday and made the drive up to the foothills, where I waited at a favorite spot for the sun to drop and the moon to appear. Over the years I’ve accumulated lots of pictures of these trees beneath a variety of skies, with and without the moon. My composition decisions on each visit were mostly determined by the conditions: clouds, color, the moon’s direction, and the moon’s elevation above the horizon. Saturday night’s cloudless, unspectacular sky spread a simple canvas that emphasized the crescent moon floating above the day/night transition I love so much. 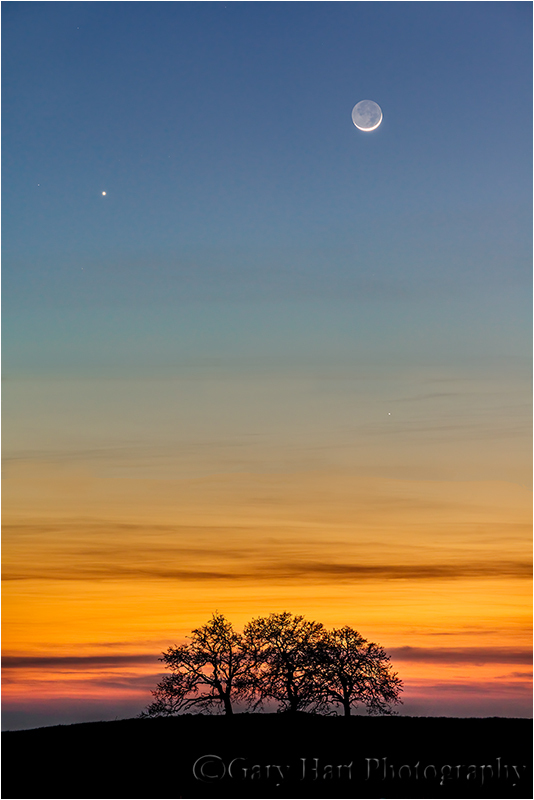 As an added bonus, Mercury joined the party, leading the moon to the horizon (above the tree on the right). In the deepening darkness I moved up and down the road to change the moon’s position relative to the trees. With the moon fairly high, I found that moderately wide, vertical compositions worked best. I underexposed slightly to and emphasize the trees’ shape with a silhouette; with nothing else to balance my frame, I decided on the symmetry of an isosceles triangle connecting the trees and moon.